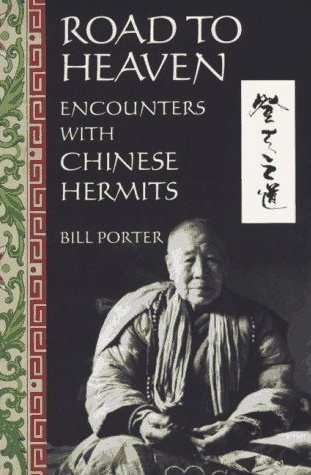 A review of Road to Heaven: Encounters with Chinese Hermits by Bill Porter. Not long ago I ran across a new Buddhist blog that says it is for people who “are interested in meditation but don’t want to pretend they live in ancient Asia.” I try not to get too worked up about how people characterize Buddhism, but that line about pretense got my attention. Were they talking about me? I live in Los Angeles where I practice at a Zen Buddhist temple that uses the Japanese monastic form. I meditate in Japanese-style robes and occasionally eat with chopsticks. I recite chants that might be in English, Japanese, or a garbled approximation of Sanskrit. I’ve become accustomed to using Japanese names for things that have perfectly usable English counterparts—koromo for robe, zen for meditation, Maezen for me. I never intended to play-act, but now I wonder if others see the whole rigmarole as silly stagecraft, like a living nativity scene at Christmas or a weekend Civil War reenactment. A similar question seems to be on the minds of quite a few Buddhists these days: the question of what an authentic version of American Buddhism should look like. The presumption is that it is bound to look different from its antecedents. It must be more relevant to contemporary culture, more comprehensible to the Western intellect, and more technological so it can be transmitted to the comfort of your own home before it dies out altogether. The debate never troubles me from the quiet of my meditation cushion in the inner-city neighborhood of the Zen temple. Outside, people shout at one another. Homeless people push shopping carts down the street at dawn. Trucks rumble past and set off car alarms. Hip-hop pounds out from the windows of cruising cars. Tamale and ice cream carts, ambulances and police helicopters keep up a steady din. In the midst of it, I am never confused about who or where I am. The question of affectation doesn’t disturb me when I practice, only when I don’t. The search for authenticity propels spiritual journeys. Doubt inspires the quest. Disenchanted with the deterioration of Buddhism in his own time, the 13th century Japanese monk Dogen Zenji traveled back to China to find what he believed was the genuine teaching before he returned home and vivified the practice of Zen. Antiquity has little bearing on obsolescence or Rumi would not be America’s best-selling poet. There might be something worth keeping in the relics, but how do you know what it is? Sixteen years after its original publication, Counterpoint Press re-issued Road to Heaven, Bill Porter’s travelogue about his search for Taoist and Buddhist hermits in China’s Chungnan mountains in 1989. To say that the work is influential is to overstate; even well-known books about Buddhism have scant reach among dabblers who don’t want to pretend they live in ancient Asia. But Road to Heaven has inspired a few intrepid travelers and a remarkable number of Chinese seekers who needed a bearded barbarian like Porter to show them the spiritual tradition alive in their own backyard. That startling turnabout—the robust rebirth of Chinese Zen in the last decade—is what makes a reading of Porter’s account worthwhile. Not because it depicts the end of a forgotten past, but because it foretells an unexpected future. Among the coterie of translators conveying thousand-year-old Chinese poetry and Buddhist texts into English, Porter stands out, in part because of where he has set foot. He came to his trade not by academic intention, but by accident, when a youthful trek to Taiwan in 1972 turned into the next 20 years of his life. Living in Taipei and Hong Kong, he began to translate and self-publish obscure enlightenment poetry under the pen name Red Pine. Returning to the United States in person and later, in name, Porter published acclaimed renderings of The Diamond Sutra, The Heart Sutra, and The Platform Sutra. He lives in Port Townsend, Wash. When he undertook the hermit hunt in 1989 with photographer Steve Johnson, Porter was laden with conventional thinking. During the Cultural Revolution, temples were ransacked and the clergy, purged. The hermit tradition that originated 5,000 years ago was believed to be gone for good. That’s what he was told, but he went looking for artifacts anyway. Porter’s trek is shadowed by pessimism and freighted with distractions. Remaining temples are corrupted by tourism and operate as mere showplaces. Government agents intervene menacingly. Official Buddhist spokesmen toe the party line suspiciously. He details the trip with the immediacy of a live blog: meals, mattresses, wrong turns, rainstorms and a helluva lot of walking. Porter eschews meditation for himself, and I began to wonder if his chronology was compensatory proof that he pays attention. My own attention flagged along the way. As I was getting lost in the misty elevations of the story—fogbanks of history, literature and geography—he would step into a clearing to find a hut hugging the mountainside. Thus this mountain monk doesn’t understand at all. Why come to the mountains? It is a good place to practice. I just pass the time. Do you practice very much? Entranced, I can’t help but keep going. The book had a similar effect on American filmmaker Edward Burger, who credits it for inspiring his luminous 2005 documentary of hermit monks, Amongst White Clouds. Finishing, I quickly borrowed a copy of Porter’s most recent travelogue, Zen Baggage (Counterpoint, 2009), and leapt onboard his return trip. When Porter returns to China in 2006, he’s on a pilgrimage to sites associated with the first six patriarchs of Chinese Zen (440-713). The ancient sites are still there, but there is a spiritual renaissance underway, and he is greeted as a patron and celebrity. Temples are being rebuilt and expanded. Monasteries are full. Ceremonies attract thousands. Meditation halls have to stagger their schedules because there are more monks and nuns than room to sit at one time. In some cases, private benefactors have supplanted the government as the major source of funding. Tourism thrives along with serious practice. The two are not mutually exclusive after all. The past doesn’t hinder the future. It wasn’t until the last page of Road to Heaven that I felt I’d found an answer to the question of Buddhism’s American incarnation. Porter is about to leave China, and he’s buying souvenir stamps for his son in the city of Sian. He follows a hand-painted sign to a dilapidated temple in the middle of town. Monks appear and ask what he is doing. When Porter tells them he has been visiting hermits, they laugh. Where else can American Buddhism be but here? What else can it look like but you or me? Wherever you are is a good place to practice, and practice is the only thing that matters. Verses excerpted from “Song of the Grass-Roof Hermitage” by Shitou Xiqian (700-790) translated by Taigen Dan Leighton and Kazuaki Tanahashi and published in Cultivating the Empty Field (Tuttle, 2000).